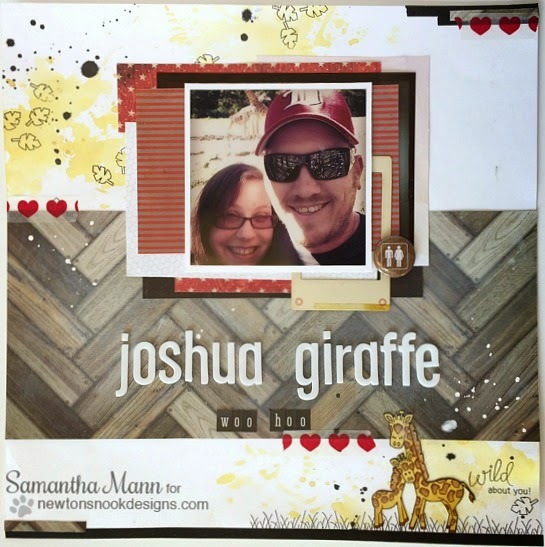 "Wild about You" Page Layout! Do you use your stamps in Scrapbooking? They can really add a bit of fun customization to any scrapbook page! Samantha Mann always has great ideas on how to do just that! Today she created this fun scrapbook page using the Wild Child stamp set. I love how she used the little leaves to create a fun background with some ink splatter in the upper right corner. Then in the lower left corner she created a grass border and added in the fun giraffe couple. I'm guessing that Joshua is a bit taller than Samantha and that's why she titled it "joshua giraffe." Ooh.. I just noticed that in their photo you can see a little giraffe couple behind them that's posed in a similar position to the giraffe stamp she used! So cute! To read more details visit Samantha's blog Sam's Scrap Candy. Such a fun layout!! Love how she incorporated the NND stamps! Happy New Year + New Design Team!